The Republic of Cameroon celebrates its National Day on May 20. It commemorates the creation of a unitary state in 1972. Cameroon was a German colony (German Cameroon or Kamerun) from 1884 to 1919. When Germany was defeated in the First World War, the colony became a League of Nations mandate territory. It was divided into two parts: British Cameroons and French Cameroun. In 1946, the mandates were converted into UN Trust Territories. French Cameroun proclaimed its independence in 1960. About a year and a half later, the southern part of British Cameroons merged with the newly created republic. 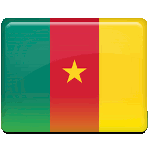 Thus the Federal Republic of Cameroon was established. In 1972, a new constitution was adopted, following a referendum held on May 20. It abolished the federal system of government and replaced the federation with a unitary state. The new unitary country was originally called the United Republic of Cameroon, but in 1984 the republic obtained its current name. As the country has no single date of independence, the anniversary of the 1972 referendum was declared as National Day of Cameroon. It is celebrated by speeches made by President of Cameroon and government officials, marches and parades.